Day Four of our week away dawned to a foggy start, due to a clear sky and no wind – perfect walking conditions. 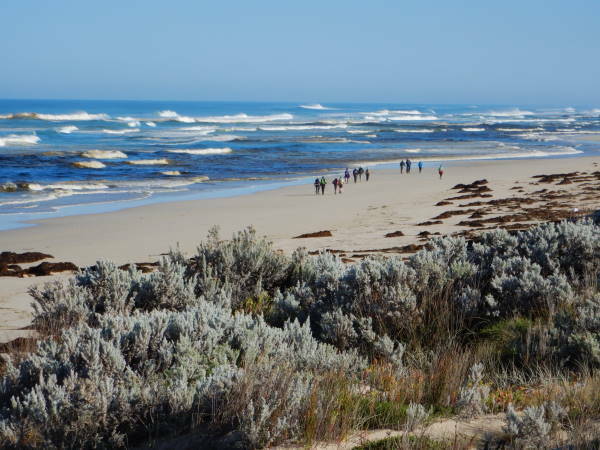 Our destination today was a loop walk around the environs of Lake Monibeong, six kilometres along the beach, followed by an eight kilometre return via the heathlands behind the sand dune system. A short walk was also on offer, and the walkers in this group (ably led by John) checked out Cape Monetesqieu, and the environs of Lake Monibeong. Because of the number of walkers involved in the longer walk, we split into two groups, those in the first group were designated as ‘the greyhounds’ and the second group was ‘the labradors’. 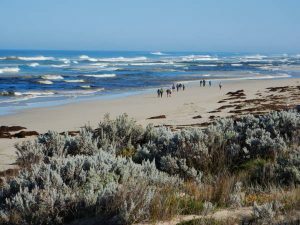 For both groups, the walk started with an energetic climb over an enormous sand dune, and then we were down on the beach. Items of interest here included a turbulent seascape with tannin stained waves, and many interesting outcrops of sedimentary rock. After six kilometres, we crossed back over the sand dune system, and in to the realm of tea-trees, casuarinas, reed grass and sedges. 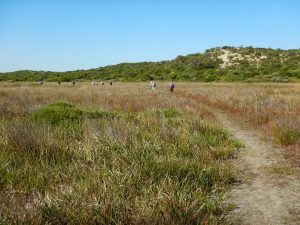 The walking track was very interesting, as it weaved in and out of dunes and heathland, and there were many shady glades to take a rest. Lunch was enjoyed in the shade of some very old tea-trees, where we were placed under surveillance by a curious owl. The Lake was very scenic, and we had several different viewpoints of this large waterway, before arriving back at our cars. Tomorrow (Friday) we will be walking at Cape Nelson, having decided to swap the Mount Richmond and Cape Nelson days because of the possibility of showers on Saturday.